When you’ve got that super-excited new pup that’s jumping up at everything, you might be a little nervous about introducing it to your kids. That’s understandable. As a caring parent and pet owner, you’re probably trying to find the right solution. We’re going to look at a number of different safety tips so that you can make sure both your children AND your pup are as happy as possible as they both get used to the new situation. 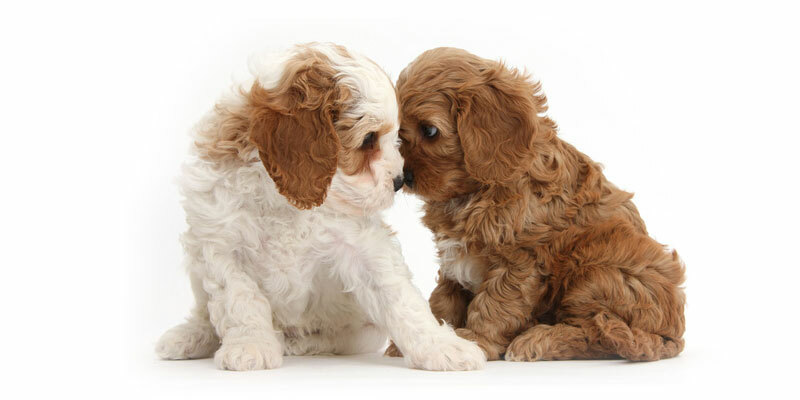 If you’ve used our puppy finder to find the perfect puppy near you, then you should already have one of the happiest and most trainable pups around. Our pups come from breeders with integrity, and that means they’re some of the easiest to train and happiest to get along with for all the family. That being said, there can still be a slight settling-in period for any new pup—especially when you’ve got a young family. The truth is, many pups are a great addition to your family. This shouldn’t be seen as an obstacle you need to overcome, but a learning process for both your children and your pets. Once everything has settled down, our Doodles can actually help your kid feel safe, loved and even help them learn new skills. But if you’re a little worried about introducing your dog to your young children, you’re going to need to work through some training steps safely and carefully. 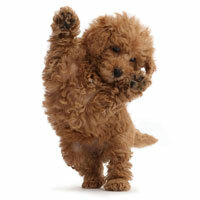 Your dog might need a bit of training before it’s able to be left unsupervised with children. Remember, all dogs are different. Even though our pups are some of the happiest around – they’ve each got their own individual personality. That’s what makes them so great. But that also means you might want to consult a professional dog trainer for some extra help in certain situations. 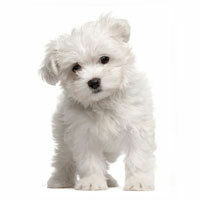 You shouldn’t really be expecting a super-young puppy to be able to be left alone with children, trained or otherwise. That means you might want to wait a few months before you start your introduction period. We’re talking about older puppies that are over around 6 months, and one that’s finished the teething process. You don’t want to just think about the age of your puppy, either. The age of your children is also important. You’ll need kids that are old enough to understand instructions and obey rules about how to interact with the pup. That’s the thing with this sort of training, you aren’t just training the dog how to behave with children—you’re teaching your children how to live safely with dogs, too. While it’s understandable to want your children to grow up alongside your pets, you also need to understand that you can’t rush into things. It’s a safer experience for your whole family if you keep your pets and children separate while either of them are still really young. They should have decades together if you can just hold off while they’re only a few months old. You’re probably already aware that it’s a bad idea to simply throw your puppies and children together and hope for the best. Supervision is key. And it’s something you need to take seriously. You shouldn’t expect this process to be over within a couple of weeks. Things can take time, but it should be worth it in the end—especially when you’ve got a loving pet-friendly family for years to come. If your toddlers are struggling to communicate with other humans, then can you really expect them to be able to communicate with animals? It’s the same for your dogs, too. Can you really expect them to be able to understand or predict unpredictable children? That’s why they both need constant supervision, at all times. At least for the first few months and until you’re sure they can be left alone. 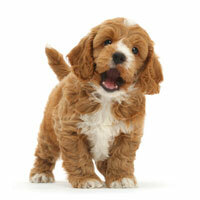 The problem is, young puppies and young children both actually need your complete attention. How can you provide your complete attention to two different parties, that are both demanding different things? You need to start with separation. Create a separate area for your pup so it can get used to your family without having unprotected access to your young children. Baby gates are a good idea, because they’ll let your dog get used to the sights, smells and sounds of your family without being able to jump up at your children or get carried away. You can also use playpens or crates for this—but make sure your pup gets plenty of space and outdoors time. With this setup, you can gradually start getting your pups and kids used to each other, without throwing them in the same area. You should never leave your pets alone with your young children until you’re sure you’ve trained them well enough, and that they’re obedient enough to obey all your rules. That means you need to make sure they’re both old enough to understand and follow your rules, and it’s another reason why you can’t do this training when either your children or dogs are too young. Some experts says that children need to be at least 7 years old before they can be left alone with a puppy, and that the puppy itself should have been socializing under supervision for a number of months. But remember, every puppy is different. So if yours is acting up or still getting too excited around members of your family, you might need to allow longer—or even consult a dog-training professional for some more advice. Some dogs should never be left alone with children, although this is rare. 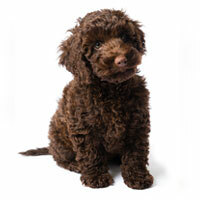 Our Doodles are normally a wonderful addition to any family, even those with very young children. Once you’ve got supervision and separation sorted, you need to start training your dogs effectively, as well as teaching your children how to behave with animals. 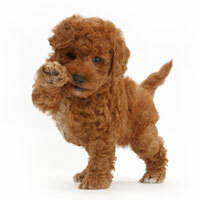 Make sure your children know that they should never poke or pull your puppy. Have them follow your instructions, watch what you do, and make sure they know what “no” means. You can introduce light touching in the form of stroking, and reward your children by telling them they’ve done well. Dogs often don’t like being approached quickly, so make sure your children know that they shouldn’t run after your pets. Your pups won’t want to be cornered, either—this could result in biting out (even from a normally friendly dog). You need to make sure these rules are understood and followed carefully. Teach children to approach pups slowly. Your dog could also act erratically if it’s woken all of a sudden, so you’ll also need to teach your kids to leave the pup alone if it’s sleeping. You can start introducing fun, non-aggressive games to your family so that your kids and pets can bond and get used to having fun together in a friendly and productive way. Try getting your kids to throw a ball for the dog to return, or take the dog for a walk while allowing your child to hold it’s own separate leash. You’ll still be keeping the dog on it’s own leash, but it’ll make your children more involved and develop a sense of responsibility between them and your puppy. One problem with training young dogs to play is that many of them will try and “nip” your toddler with their teeth. This isn’t always aggressive, and it’s how young dogs will naturally play with each other—but it’s imperative that you eliminate this sort of behavior as soon as you can. It might seem harmless to begin with, but if left to develop—it could lead to more aggressive behavior as your dog grows up. You need to teach your puppies that children are not their littermates. You should make sure that no human (child or otherwise) ever uses their hands, fingers or feet for play—and make sure you avoid tug of war games completely. While this sort of play might seem fun when your dog is still a pup—it won’t be when they’re still trying to bit you as a fully grown dog. Teething can be painful to pups, just like it can with babies. Chewing is one natural solution to this, and should be encouraged—but only with specific chew toys. 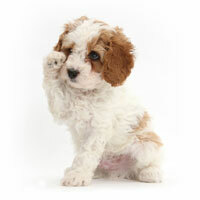 Your puppy will want to chew almost anything during teething, so you need to protect your kid’s hands and fingers. You might want to restrain your pup or keep it completely separate from your children while it’s still teething. That’s another reason why waiting until your dog is a little older before introducing it to your family is a good idea. 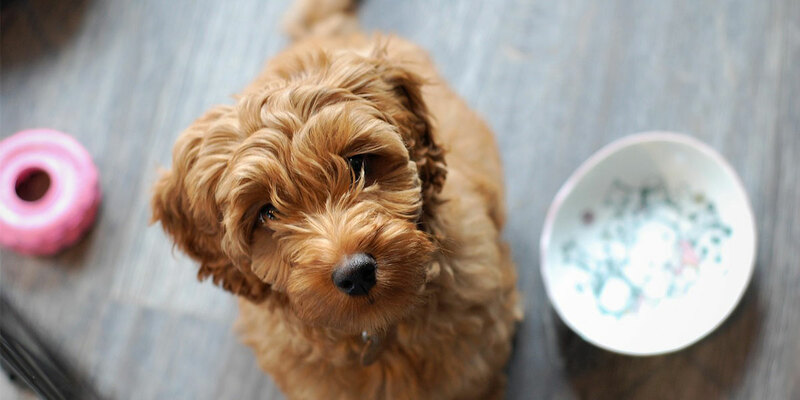 Your children should know that they should never put their hands in a dog’s food bowl, nor should they ever take food away from a pup—especially a hungry one. Dogs can see this as a threat and may behave aggressively. Train your puppy to leave children alone when they are holding food themselves, and make sure they know that only you can hand them something to eat. Introducing your pup to young children can sometimes be difficult, but once you’ve got one of our fabulous Doodles fully integrated into your family—you’ll know it was worth it.